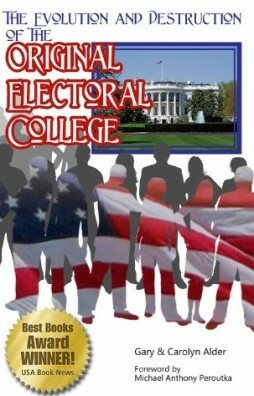 Having studied this book, and realizing that the most important function of the Electors was to nominate outstanding potential candidates rather than to rubber-stamp the results of a popular vote, the reader should readily see that the following plan is a another step in the wrong direction. This popular movement to bypass the Electoral College will not result in electing better presidents. The National Popular Vote bill would reform the Electoral College by guaranteeing the Presidency to the presidential candidate who receives the most popular votes in all 50 states (and the District of Columbia). The bill would enact the proposed interstate compact entitled the “Agreement Among the States to Elect the President by National Popular Vote.” The compact would take effect only when enacted, in identical form, by states possessing a majority of the membership of the Electoral College (that is 270 of the 538 electoral votes). Under the compact, all of the members of the Electoral College from all states belonging to the compact would be from the same political party as the winner of nationwide popular vote. Thus, the presidential candidate who receives the most popular votes in all 50 states (and the District of Columbia) will be guaranteed a majority of the Electoral College, and hence the Presidency. …the compact has the additional benefit of eliminating the possibility that a presidential election might be thrown into the U.S. House of Representatives (with each state casting one vote). All 50 states and the District of Columbia have introduced bills to modify the election process. The goal is to circumvent any remaining functionality of the Electoral College and elect the President directly without amending the Constitution. The method is to force the Electoral College to reflect the national popular vote. Eight states and the District of Columbia have enacted the National Popular Vote agreement. Their electoral votes total 132. In our discussions with people concerning The National Popular Vote compact (NPV), we see some enthusiastically predicting it will restore “fairness” to the U.S. presidential elections while others say that it will be a disaster to the political future and well-being of the less populous states. Our opinion is that neither of these positions is accurate. NPV is the last step in the evolutionary march from a complex constitutional representative republic that promotes freedom, to a simple republic that promotes democracy under political party control. The Electoral College has already been reduced from the nomination process for statesmen to a statistical representation of the outcome of each state’s popular vote for president. To make it reflect the outcome of the nation’s popular vote instead—is no big deal. We ask ourselves: “What is the outcome if NPV is defeated?” Our answer, we travel no further down the wrong road—the road leading away from the intelligent design of the Framers. This however does not reverse the evolution, abuse, and destruction of the Framers’ plan that has already taken place. In order to reestablish freedom, there must be a return to the founding principles of the nation. On the other hand, the worst consequence of implementing NPV would be that without the threat of a potential exception to the President always being elected by strict popular vote, no longer would people ask the question, “Why did the Framers establish the Electoral College?” Therefore the original Electoral College would become no more than a relic of an ingenious political system designed to establish and maintain freedom—lost in history. Whether NPV passes or not, does nothing to release the stranglehold that the political parties have on elections and every other aspect of government operations. The candidates will still be political party pawns. As long as we have to choose between the lesser of two evils, the purposes and benefits of the original Electoral College will always remain hidden. In this book we have shown the evolution and destruction of the Framers ingenious plan to elect the best Presidents. The National Popular Vote compact (NPV) could be considered the coup de grâce to a system that is all but gone.